Your rooftop does a lot more than protect your business from the elements. Your roof can be a platform for HVAC units, vents, antennae, satellite dishes, elevator equipment, skylights, and, for some businesses, even a meeting space. Because rooftops can be such busy places, roof walkways are an important part of protecting both your roof and the people who use it to do their jobs. But you don’t want to turn the entire rooftop into a walkway, so the question becomes where exactly do you need them most? 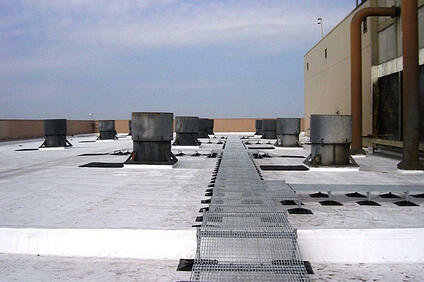 In short, anywhere you need to protect the roof or ensure roof safety for your workers. According to the Bureau of Labor Statistics, roofing-related fatalities accounted for 1/3 of fatal falls in construction from 1992–2009. And a 2011 OSHA study reported that falls from elevations cost insured roofers $54 million per year or about $106,000 per injured roofer. These statistics are far more important to you than for liability reasons. They prove to show that rooftops can be riddled with safety issues. Beyond height dangers, roofs can be risky places for a number of reasons. The biggest reason is often environmental. Roof surfaces can be hot, icy, slippery, sticky, or textured in a way that can cause trips and falls depending on the weather, which can vary from day to day. Therefore, you should install roof walkways anywhere maintenance workers need access. You can also use walkways to direct traffic away from paths that aren’t designed for traffic and protruding objects like pipes, ducts, and other rooftop components. Sloped roofs present both a challenge and an additional layer of concern for roof safety. Even on flat roofs, maintenance workers have to navigate ducts, pipes, and other types of mechanical equipment often found on rooftops. Without walkways, maintenance workers have to crawl up, over, and around piping and ductwork. They may at times step on these structures instead of over them. Which is a BIG no no! They also may need to use additional equipment like steps, scaffolds, or ladders to access hard to reach places. Not only do those temporary fixes compromise roof safety for workers, they can shorten the life of your roof -- especially when it comes to ladders and other equipment that can puncture the surface. 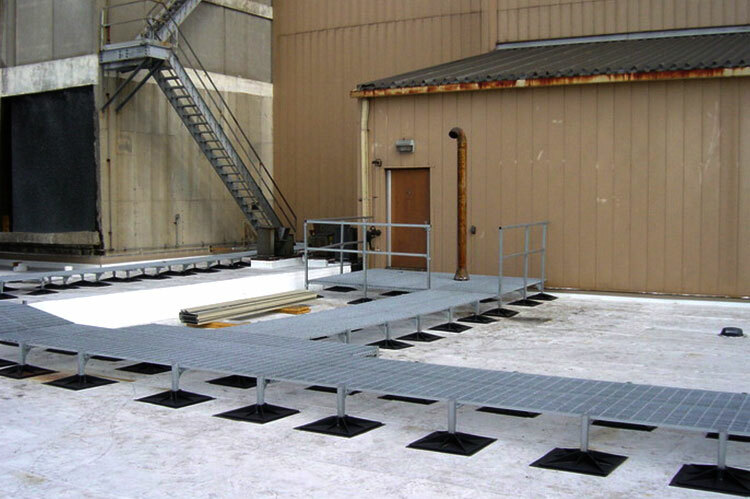 Ramps, stairs, and crossovers are an important part of any roof walkway system, and should be incorporated whenever equipment is not easily accessible for maintenance repairmen. More and more businesses are “going green” by using their rooftops for gardens and meeting spaces. While those can be great uses for a rooftop, they also increase traffic from people who may not be trained in roof safety. You can and should use roof walkways is these areas with handrails to make it abundantly clear which areas of the roof are meant to be used and which are off-limits. Getting on and off of a roof can also be risky, especially if there is debris, water, or snow on the roof. Walkways with handrails protect workers from the edge of the roof when there are obstacles in the way. Roof walkways also ensure that, from a worker’s first step onto the roof, he comes in contact with a safe surface rather than a slippery surface covered in water or ice. Walkways will make it safer and easier for anyone to enter and exit the roof. Roof walkways aren’t a luxury; they’re an essential part of your roofing system, serving to protect both your employees and the roof itself. It’s a small investment that will provide benefits for your employees, rooftop visitors, and equipment for years to come.